I'm not too happy with this picture (took it from my cell phone camera) but I'm darn excited about how this dish turned out. This is the first time I made chicken gheeroast and I must say it tasted quite good. I had been to my friend's place for lunch and as she cooked her signature chicken biryani on one side of her kitchen, I hijacked the other side to make chicken gheeroast. It was a fun cook out (though we cooked in), while our kids enjoyed their playdate in the living room. As we sunk into the aroma of the dishes, I managed to take some quick pictures with my cell phone. Hopefully one day I'll update these with better pictures. 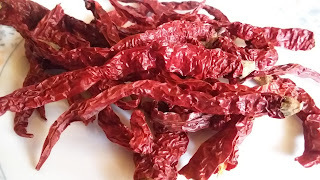 Before I go to the recipe, just wanted to let you know that this is a spicy Mangalorean dish made of a particular type of dry red chilles called byadgi (or kumte mirsang). They look like kashmiri chillies. They are not particularly too spicy but do give a nice deep red colour to the dish. If you are alarmed by the number of chillies used, you can reduce the number and later on if you think the dish needs to be spicier, you could add some red chilli powder (roast it a bit in hot ghee before adding). Also, I love adding different kinds of spices to this dish, If they are not available you can add some basic spices and omit "optional" spices. Also please note that in between all the talking and laughing, I may have eyeballed the ingredients so here's a rough estimate of what I had put in. Please don't hold it against me :D. If the dish turns out too spicy, squeeze some lemon juice. If it doesn't turn out spicy (and M'loreans like this spicy), you could add a tsp or more of red chilli powder in the end (like I mentioned, roast it a bit in hot ghee before adding). I did end up adding chilly powder even though I used so many chillies! *This is called ghee roast for a reason. 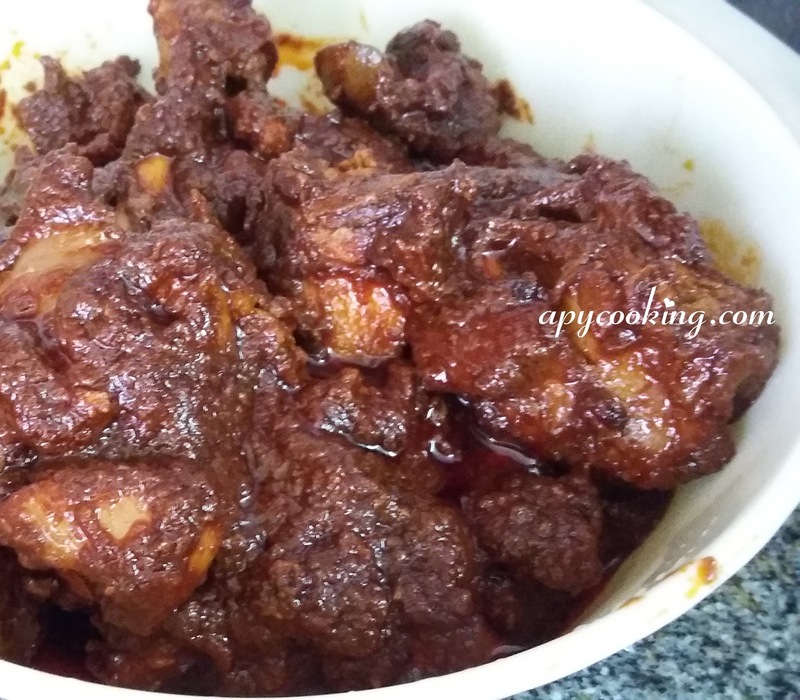 Marinate chicken with curd, salt, red chilli powder and turmeric powder for atleast 2 hours. Meanwhile make the red chilly paste. To do this, in a large pan, heat 1 tbsp ghee. Add coriander seeds, jeera, cinnamon, cloves, garlic and the optional spices and roast lightly till you get a nice aroma. Transfer this to a blender jar. In the same pan, heat 1 tbsp ghee. Roast the chillies. Slowly pour one cup water on the chillies and cook for a couple of minutes. Allow to cool. Remove and transfer the chillies along with the water to the blender jar with the roasted spices. Grind with tamarind and sugar into a SMOOTH paste. Add more water if needed. In a deep pan heat 2 tbsp ghee. Add chicken pieces. Cover and cook till chicken is 90% cooked. In the meantime, in a large deep bottomed pan, heat the rest of the ghee. Add the smooth red chilli paste, 1/2 cup water and keep roasting this masala on medium or low heat for about 10 minutes. Add the almost cooked chicken, salt to taste. ( You can add more water if you want some gravy with it). 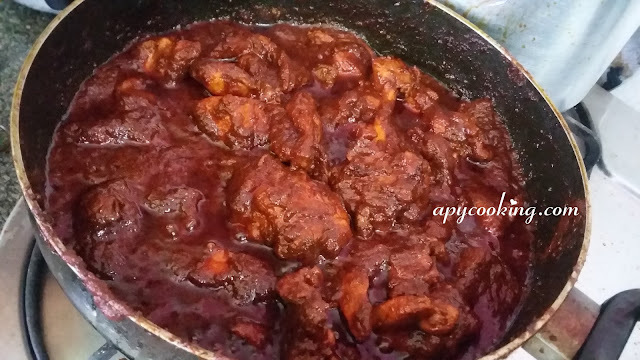 Cover and cook for another 10 to 15 minutes till the chicken is completely cooked and coated well with the masala. 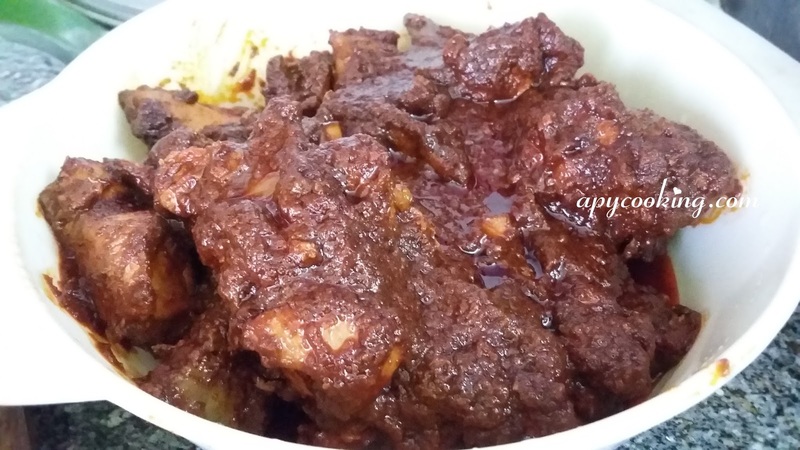 Again, if you cannot digest spicy food, this dish may not be for you. But ofcourse, you can halve the chillies and try it out. This tastes good with bread or pav or naan or any kind of rice.